by Anna Horne, mother of three under 10's; food lover; home cook, Assistant Food Stylist; recipe developer and writer. Baking is my first love and having kids has given me the perfect reason to tinker in the kitchen and indulge my passion. Of course it’s all for them. In my quest for the ultimate cookie, and having tried and tested many a recipe these are up there as striking the balance between crispy baked edge and slightly undercooked gooey centre. I’ve made these with many a chocolate addition but the Curly Whirly is my current fav. You add these towards the end of the baking time to soften but keep them in tact. The result is pretty special. In a large bowl, beat together the butter and sugar until well mixed. Add the egg and vanilla and mix again until smooth. Add the remaining dry ingredients and mix well until it forms a stiff dough. Place in the fridge for half an hour. Preheat the oven to 190C, 170C fan, gas mark 3. Line 2 baking trays with parchment and have 2 extra pieces ready. The cookies spread out so it’s easiest to bake in two batches. Using an ice cream scoop or two spoons, form balls of dough and place 4 on each tray. Don’t flatten them. Place the first two trays in the oven and bake for 8 minutes until spread but are not quite cooked. 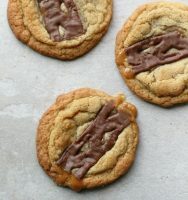 Remove from the oven and place a piece of Curly Whirly on top of each cookie. Return to the oven for a further 3 minutes then remove. They will be browned round the edge but still soft looking in the centre. Carefully slide the baking paper off the tray and set the cookies aside to cool. Repeat with the remaining mixture using the two fresh pieces of baking paper on the trays. Allow to cool for 10 minutes and then see how long they last! You could use anything you like in place of the Curly Whirlys. I stand in the supermarket sweet aisle for inspiration. Twix bars, Wispas, Mars Bars chopped into pieces. Smarties or Minstrels would work and the hard shell means you could place these on top or stir them through the mixture at the beginning of baking as they will hold up more to the heat. This is a great recipe to freeze. Make up to the ball stage minus the chocolate then freeze on a baking sheet well covered with cling film. Once the dough balls are frozen you can transfer them to a freezer bag and remove a few to bake as required. I believe these will last for a few days in an air tight tin. To be honest, I’ve never done that though – they don’t last long enough! Or maybe you love the idea of making your own pastry but don't know where to start? Does the idea of entertaining your friends exasperate rather than excite you? I can offer bespoke advice based on your needs.